It’s important to rest—to stop working for a while and to do something different, something enjoyable. 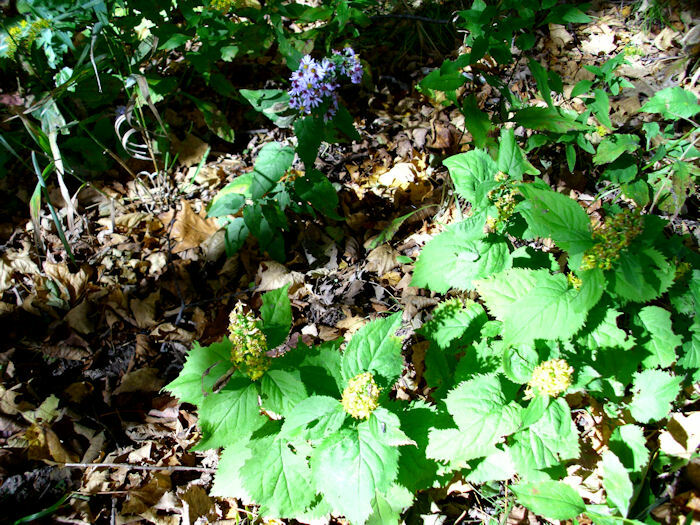 In Remembering to Rest, I talked about Wildcat mountain, a favorite place to go in the fall to unwind a bit after a summer of hard work in the garden. Once the work gets to that magic point where it’s possible to take a little break, reflecting on the summer is a good way to get ready for the rigors of winter. This year I went to Wildcat mountain a little later than usual because the weather has been warmer than normal and it takes me a bit longer now to get to that magic resting point. Of course, my first stop after my picnic lunch is observation point. I went to Wildcat Mountain on a Tuesday, so I more or less had the park to myself. Yes, there were other people, but we all seemed to sense the need to respect each others’ privacy. 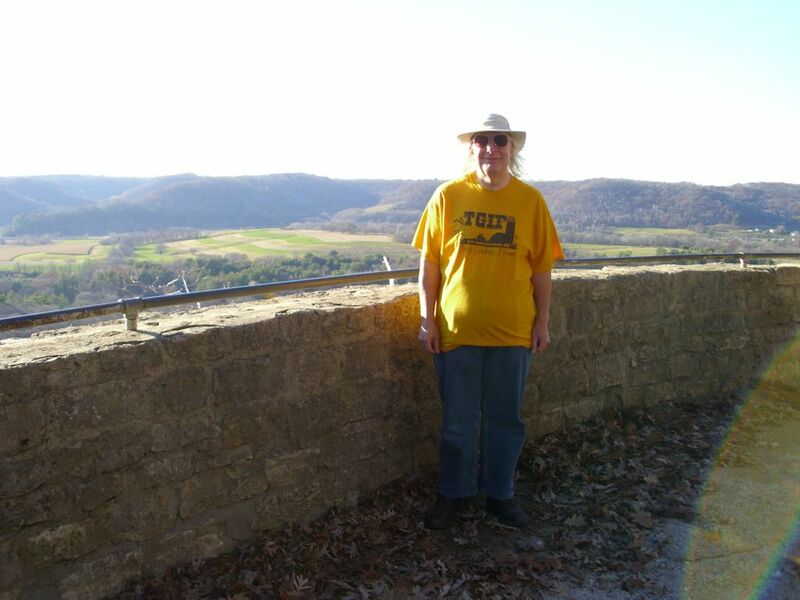 I did ask one young lady to take my picture at observation point. 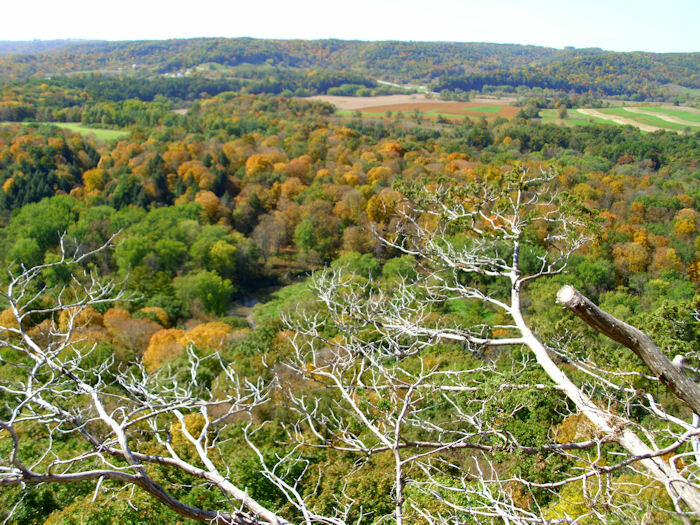 As you can see, the fall colors are past their peak, but it’s still a beautiful view. I took my Old Settler’s Trail hike. It’s a 2.5 mile trail that I’m sure some people would consider a bit mundane, but I find it plenty exciting and more than a little exercise. The 1.5 to 2 hour hiking time only counts if you’re in shape and I definitely don’t recommend the trail if you have a fear of heights or any problems whatsoever walking. I finished the trail in one hour and 43 minutes this time—not my best time, but I took extra care because I was alone on the trail. 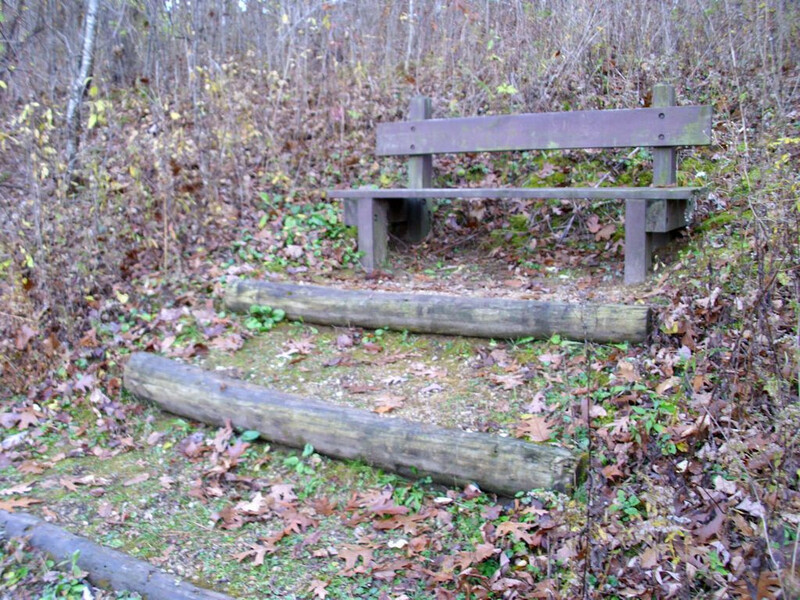 Of course, the first thing you see on this trail are the steps down. I took this picture looking back up the steps once I got to the bottom. Looking back up the first set of steps. Most of the hike is on uneven ground, but the trail is clearly visible. Staying on the trail is a good idea because you don’t really know what you’ll encounter otherwise. I saw quite a bit of wildlife, including a beautiful buck who refused to allow me to take his picture. 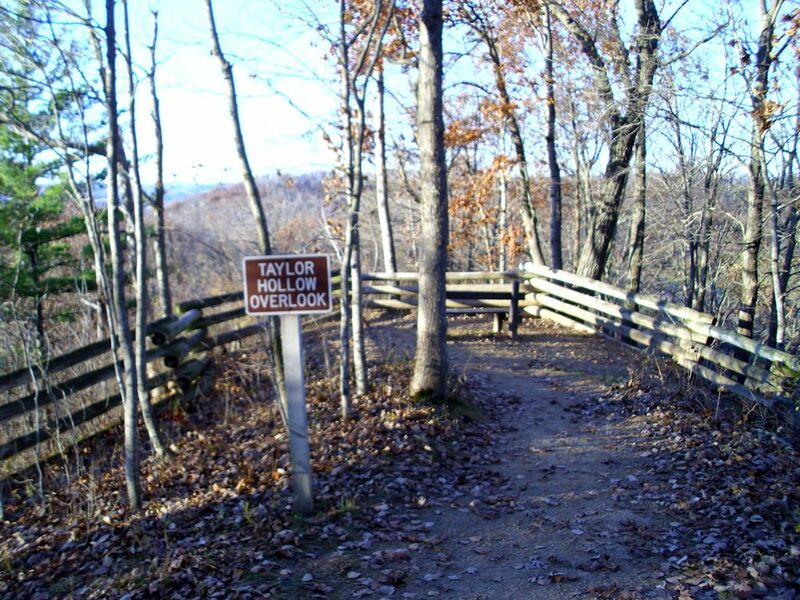 One of my favorite places along the trail is the foot bridge over a creek. It’s a nice place to take a few moments to rest and just enjoy the gorgeous scenery. The trail does provide resting points. You do need to climb up to them. However, they do provide wonderful views of the countryside while you rest. For me, the highlight of the hike is Taylor Hollow Overlook. The view isn’t quite as amazing as those provided by some other Wisconsin parks, but you really can see quite a distance and when the colors are just right, the patchwork is really quite colorful. By this point in the hike, a lot of people are starting to get a bit tuckered out, so this particular bench doesn’t require any climbing. You can just sit and enjoy the view. It’s at this point where you might want to turn around if you suffer from any vertigo at all. 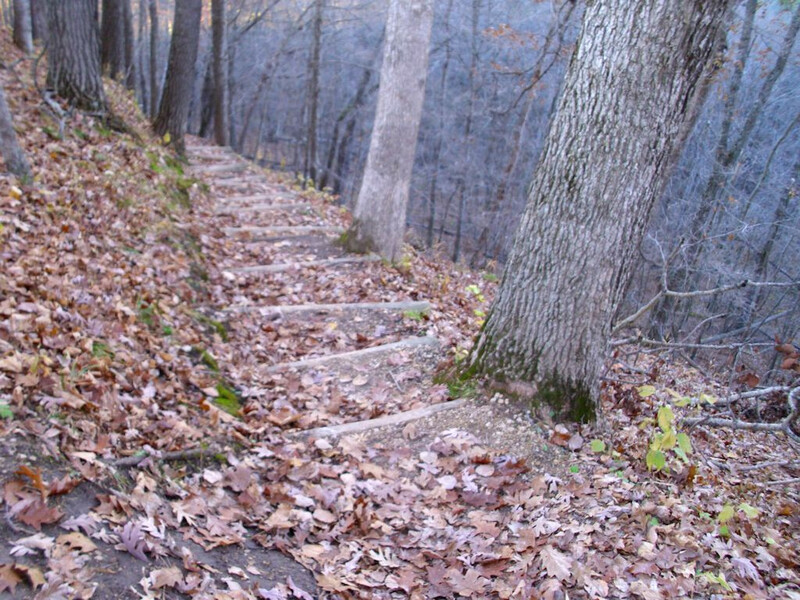 The trail becomes steep and there are no handholds to speak of. The drop would likely result in broken bones or other injury. 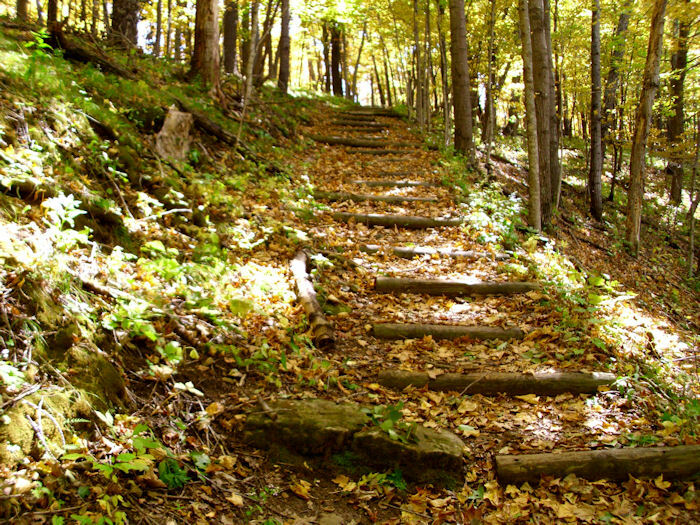 The point is that you want to take care to traverse this part of the trail with great care. 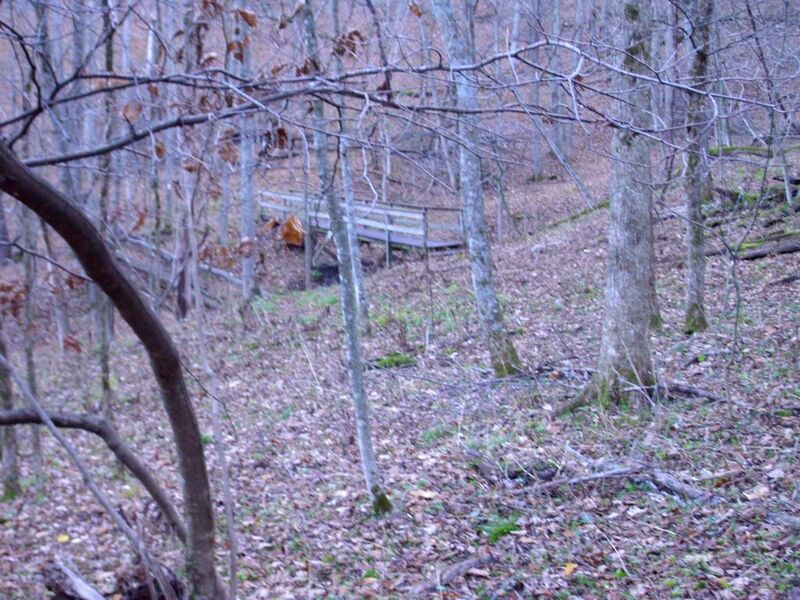 It isn’t long after you get past this part of the trail that you loop around and rejoin the trail you originally used to get down the steps shown in the first picture. This time you go up the steps. By the time you’re finished, you’ll likely be a bit out of breath and will definitely know you’ve had a workout. Still, what a place to workout! Let me know if you’ve ever been to Wildcat Mountain at John@JohnMuellerBooks.com. It’s the beginning of fall here in Wisconsin—my favorite time of the year. Everything is getting that tired look to it and the evening temperatures are beginning to dive a little more often into the 50s and 60s. The leaves are starting to change just a little. Soon I’ll be up in the woods cutting up dead trees for winter. It’s not nearly cool enough for the first fire yet, but that will come too. Soon I’ll have the smell of woodsmoke permeating the house as I enjoy the cool fall evenings in front of my wood stove. Last week I began picking my grapes and apples. Both have produced abundantly this year. In fact, just one cane produced a little over 40 pounds of grapes. The apples are smaller than normal, but plentiful, weighing the trees down. The pears this year suffered from a lack of activity from helpful insects and an overwhelming quantity of the harmful variety. The point is that it’s a time for picking things and preserving them for the winter. There is a certain feeling that comes over you as you begin to bring things into the house and see the larder shelves swell with all you’ve produced. Most of the fruit will go into juice this year, which means my Victorio Strainer will work overtime. As part of my fall preparations, I’m starting to dry the herbs that have grown all summer. My herb garden is a little limited this year because the weather just didn’t cooperate as much as it could have. Still, I have plenty of celery (actually lovage) seed to use, along with the dried leaves. The rosemary, two kinds of sage, and two kinds of thyme have all done well (though the rosemary is not quite as robust as I would have liked, it’s quite flavorful). The dehydrator is up and running now, helping me preserve the herbs I need for cooking this winter. Of course, the herb garden produces more than just herbs for cooking—it also produces a robust number of items for tea. Right now I four kinds of mint growing: lime, lemon, chocolate, and spearmint. The first three are definitely used for drinking teas only because their subtle flavors are lost in other sorts of uses. The spearmint is used for tea, cooking, and mint jelly—that essential add-on for lamb meat. Rebecca actually had eight different kinds of mint growing at one time, but they have gotten mixed together over the years or were hit especially hard by this last winter. The herb garden will need some focused attention this upcoming spring to get it back into shape. In some respects, the combination of a hard winter, a late spring, and a cool summer conspired to make this year less productive than most. It’s the reason that you really do need a three-year plan for stocking your larder to ensure that you have enough food for those years that are a little less plentiful. Fortunately, my larder has an abundant supply of everything needed to sustain life (and quite a large number of things we made purely for pleasure as well). There are some fall-specific things that I’ll eventually take care of. You already know about the work part of it, but there is time for pleasure too. 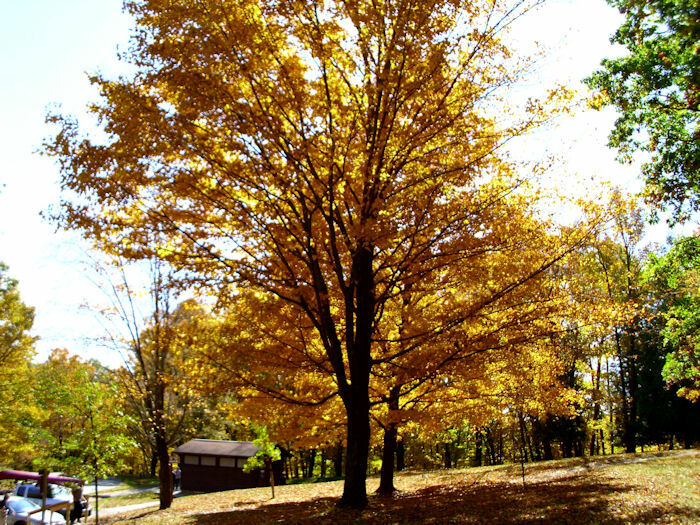 For example, I’ll take time for my usual picnic at Wildcat Mountain after the fall color begins to peak. So, how are your fall plans shaping up? Let me know at John@JohnMuellerBooks.com. It’s easy to become so involved in self-sufficiency issues that you forget to rest. Rebecca and I just finished Harvest Festival (see my Fun is Where You Find It! (Part 3) post for details), so we’ve made our big push in getting the larder filled. Of course, there is still plenty of work to do. We even have some extra pears to process this year thanks to the prolific output of our Luscious pears. With everything there is to do, self-sufficiency can quickly become more work than anticipated and definitely become work of the worst sort. Rest is necessary. You have to take time to smell the flowers and get a bit of fresh air. That’s precisely what we did this weekend when we went to Wildcat Mountain, a local state park. The tree colors haven’t peaked yet, but there are some incredibly beautiful trees. I particularly liked this pair. We took a picnic lunch and enjoyed a few games of Acey-Ducey (a kind of backgammon). 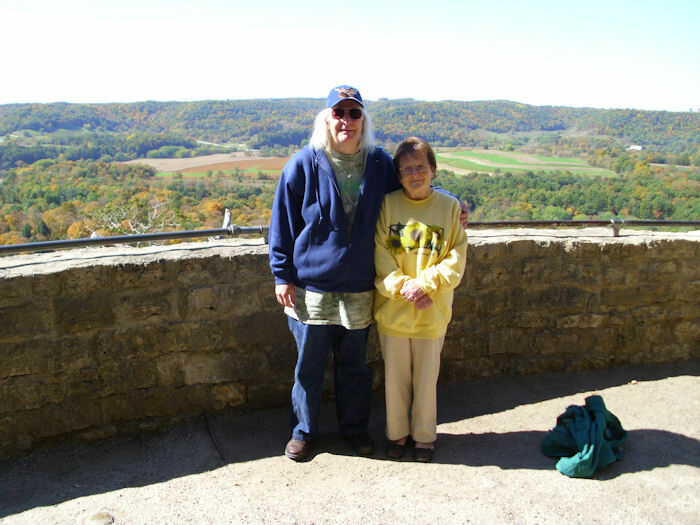 After lunch, we went to observation point, which has an amazing vista of the farms and forest in the surrounding area. Here’s just one of many views we saw. You can easily suffer vertigo looking down from this height. Here’s a picture of the two of us that gives you a little better idea of just how high we are. We also decided to take a bit of a hike. Wildcat Mountain has a lot of trails, some of which are more than a little difficult to traverse. 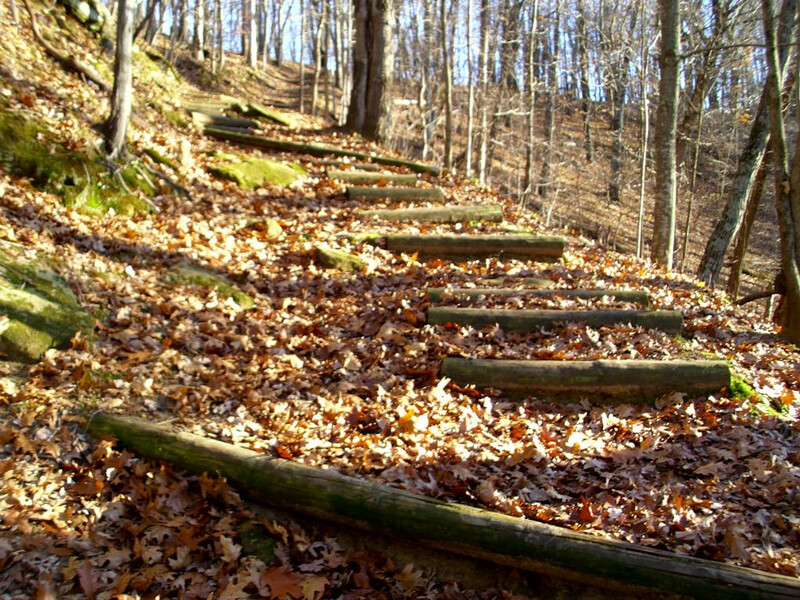 Just about all of the trails require that you climb lots of stairs. Even so, the scenery is gorgeous. We decided to take the Old Settler’s Trail. The point is that we spent some time doing something other than preparing food for winter, even if we didn’t get to rest the entire day. Part of your self-sufficiency planning has to go into rest. Without proper rest, you’ll make mistakes and your self-sufficiency plans will quickly become grueling work. Keep things fun! Let me know how you rest after a hard work session at John@JohnMuellerBooks.com.